I really enjoyed The Edge of Never. Not only did it have a fascinating story, but Redmerski made me feel for the characters. I was pulled right in. If I’m being honest, I didn’t think it needed a sequel. The ending was wonderful, closing the story up while leaving the future open. So when I saw there was a sequel, I was a little hesitant to read it. Unfortunately, the magic of the first novel wasn’t quite here. Camryn and Andrew suffer a great loss and tragedy. Andrew seems to be handling things okay, but Camryn spirals down to a dark place. After Andrew catches her taking care of her pain in a dangerous way, he decides something has to be done. Wanting to capture the hope and happiness of their lives when they first met, he takes Camryn on a road trip across the country. I had a few issues with this novel. First was Andrew’s seemingly lack of grief. He’s upset about it, yes, but for some reason it felt like he just didn’t care as much as Camryn. Camryn’s grief is palpable. She’s devastated. We don’t see that from Andrew and I would have really liked to see his feelings about the loss. He talks about Camryn pushing feelings under the rug, but it felt like that’s what he did. There was a lot of time jumping in the novel. Sometimes this works. This was not one of those times. I would have like more of their road trip. That’s what I fell in love with the first time and those are the parts of the novel I liked this time around. Camryn and Andrew finding themselves while on the road is what made me love the first novel so much. This time around, it felt like Redmerski was trying to get so much done in a condense package. I didn’t need to see all the future stuff. That actually detracted from the novel for me. I would have been completely happy with Cam and Andrew finding their happiness while driving across the country. I will say that the promises they make to each other throughout the novel really tugged at my heart. Those were there moments where their relationship shined. They were sweet and touching, demonstrating the kind of relationship they both wanted going forward. 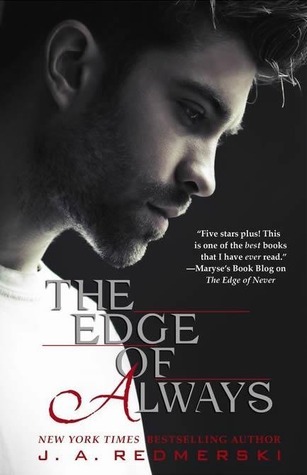 Overall, The Edge of Always just didn’t do it for me. I didn’t connect with this novel like I did the first and while there are moments of sweetness; there was a lot that I didn’t find necessary or enjoyable. I’ll probably still reread The Edge of Never, but I’ll pass on rereading this one. I know what happens in their story and I’ll just add those thoughts to the end of The Edge of Never. Thank you to NetGalley and Forever for a copy of the novel in exchange for an honest review. This entry was posted in Contemporary, Young (and New) Adult and tagged Contemporary, J.A. Redmerski, New Adult.